While having a baby brings joy to the family, it's evident that having a baby in Singapore is not easy at all. I've seen my cousin's wife juggle with work and family — she holds a full-time job and she needs to take care of her aging parents and young son. Much of her personal time is now spent on her child— it is hard to go out on dates with her husband without having her baby or parents around. This is not until I introduced RedMart to her — she now even have the time to go out on weekly dates with her husband (aka my cousin) alone! Here's 5 reasons why parents (ok, maybe her) loves shopping at RedMart! Plus, read till the end for a 20% OFF coupon code (on top of regular discounts). RedMart has a mobile app/web and desktop website — so you can shop at work, in the toilet while doing your important business, in the train/taxi/car/bus... basically everywhere. 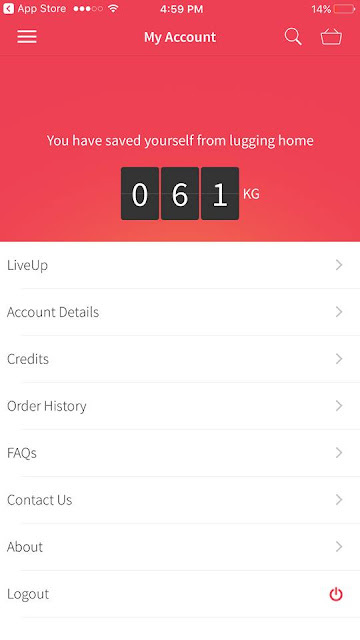 There was a time where my parents and I went to a warehouse sale — we had the RedMart app opened and we added all the items which were cheaper to our RedMart cart. It's so much easier and we had lots of fun as family! RedMart also has a price match guarantee — if you noticed that the item you've bought is more expensive than the selling price in a store specified by their T&Cs, email them the photo and they'll credit you double the difference. 2. 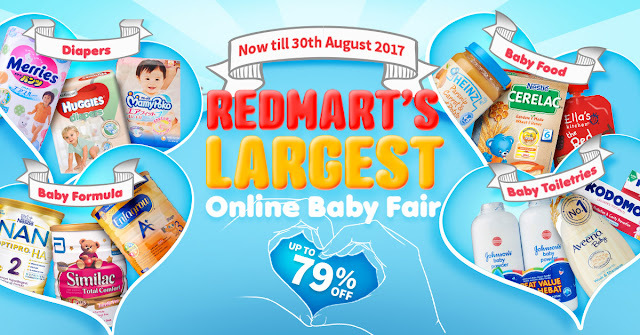 Bulky diapers + heavy baby formula — RedMart will 'carry' it home for you! Save your hands from spider veins — you can buy rice, laundry detergent, canned drinks etc. all in one basket! From Philips Avent Official Store to PlayMobil, LEGO and even Straits Times Assessment Books, RedMart almost has everything for you to browse for without going to multiple stores. They also have specialty, niche and gourmet items too. 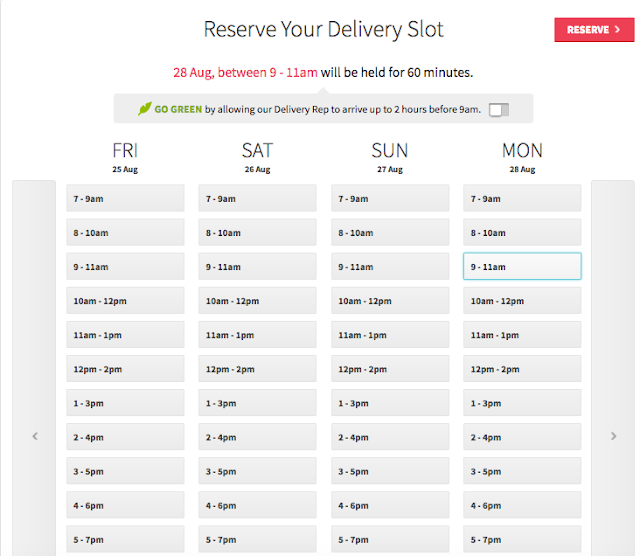 Reserve your delivery slot in 2 hour block — this saves you traveling time and time from getting through the crowd / finding items on the shelves and various aisles in supermarkets. You can even watch 2 whole hours of movie with your spouse while waiting for your delivery to arrive! When was the last time you've managed to walk straight in a crowded supermarket without saying 'excuse me' during peak hours? I can never figure out how parents are able to buy bulky diapers + heavy formula while pushing their baby's pram (or carrying their baby in one hand)... even if you drive, it's honestly very inconvenient. These frustrations from such stresses are situational opportunities for many quarrels and arguments! I can't imagine how much you can save from this 5% rebate. If you spent $600, you can save $30. It's easy for parents to spend more than $100 on baby items every month. If you get a credit card that gives you 7% rebate, the LiveUp membership plus credit card can help you save more than 10% every month. That's wise savings! Enjoy additional 20%* off within Baby and Child Category with a minimum spend of $120. Don't say I Bojio, Mai Tu Liao!